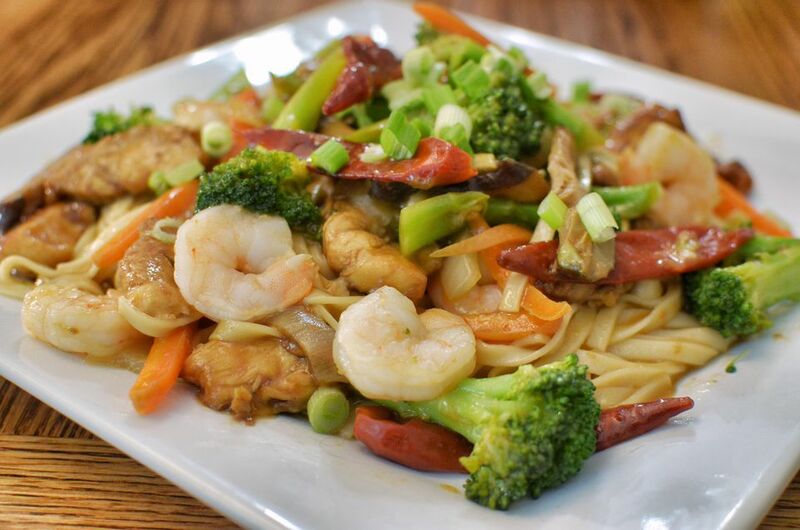 The following is a recipe for a delicious shrimp lo mein dish. Feel free to substitute Italian fettuccine or linguini if Chinese egg noodles aren't available. Rinse the shrimp under warm running water and pat dry with paper towels. Cut in half lengthwise if desired. Add the rice wine and cornstarch to the shrimp, using chopsticks to mix it in. Marinate the shrimp for 15 minutes. In a large saucepan, add enough water to cover the noodles and bring to a boil. Add the noodles, stirring to separate. Cook until the noodles are al dente - tender, but still firm. Drain thoroughly. Rinse with cold water, drain again and toss with the sesame oil. Cut the red bell pepper in half, remove the seeds and cut into thin strips about 2-inches long. Rinse the bamboo shoots to remove any "tinny" taste. Drain and cut in half. Shred the cabbage. Mince the ginger until you have 2 teaspoons. In a small bowl or measuring cup, combine the sauce ingredients (chicken broth, oyster sauce, soy sauce, and sugar) and set aside. Heat the wok over medium-high to high heat. Add 2 tablespoons oil. When the oil is hot, add the ginger and stir-fry briefly until aromatic (about 30 seconds). Add the shrimp. Stir-fry until they turn pink. Remove from the wok. Heat 2 tablespoons oil. When the oil is hot, add the shredded cabbage and the bamboo shoots. Stir-fry for a minute and add the red bell pepper. Stir-fry for another minute and remove from the wok. Heat 2 tablespoons oil in the wok. Add the noodles and the sauce. Reduce the heat to medium to give the noodles time to absorb the sauce. Add the shrimp and vegetables back into the pan. Heat through and serve hot.